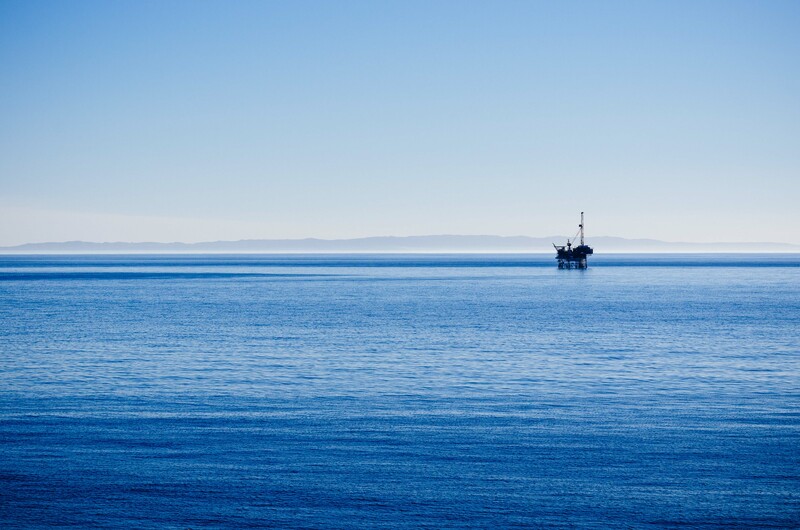 ART OF TRANSIT: An oil rig in the Santa Barbara Channel with one of the Channel Islands in the background (I think Anacapa). Photo by Steve Hymon. In the interest of getting PTC installed in the nation’s trains as soon as possible, American train passengers (and those who love them) should be willing to pay more of the price. If this means putting more federal taxpayer money into the project, so be it. Californians can probably think of a chunk of money that would work nicely: the $3.3 billion in federal cash earmarked for the Los Angeles-to-San Francisco-area high-speed rail project, a sum whose fate is uncertain after the bullet train’s latest legal setback. What’s more valuable, perhaps the most significant rail safety feature that will be adopted in our lifetimes, or the California bullet-train plan that sounds more and more like a futurist’s fantasy? Metrolink has been extremely proactive in installing PTC. But they’re the exception, not the rule. Photographer Mark Bolster breaks out his Leica M6 and black-and-white film to shoot the venerable station. And the results are predictably beautiful. One of my dream cameras, btw: the Leica M Monochom, a digital camera that only shoots in black-and-white. Only problem is the price; the body alone costs about 8,000 boxes of ziti. The City Council voted 6-3 today to resume the city’s downtown streetcar project after earlier this month voting 5-4 to put construction on hold, a rare move. There were two items in play: an audit that found that stopping the project would cost more than resuming it and a $900,000-a-year commitment for 10 years from a private foundation to pay for streetcar operations. I’m from Cincy and I think it’s a smart move to finish the project. The city has been bleeding population to the suburbs for decades and downtown desperately needs a way to help reinvent itself and lure more people back to the city beyond pro sports. No, the streetcar is not a panacea for Cincinnati’s ills — but if it lures development and jobs back to the city core, then it’s a good thing. The first of a two-part series on problems encountered by the Chicago Transit Authority when they adopted fare cards similar to TAP cards. The big question the article ponders is who profits from such efforts — and why public officials are allowing private companies to charge so-called ‘convenience fees’ to users of a public transit system. That’s eighth best among federal agencies, that is. They ranked ninth last year, says the press release. May I humbly suggest that any workplace that devotes time to issuing news releases boasting about being eighth best….never mind. Some have been built, some not — such as the Transatlantic tunnel that ranks first on the list. Los Angeles is no stranger to the hidden fee debacles like Chicago. A fee for this, a fee for that, a fee here, a fee there, fees everywhere. Then there’s the entire debate about those monthly maintenance fees for the ExpressLanes project that keeps coming up over and over again with indecisive morons on the Metro Board deciding to extend the waiver until end of February instead of making it permanent. And yet half way around the world across the Pacific, you have places like Japan, Korea, Taiwan, Hong Kong and Singapore which do not do any of these BS nickel and diming fee scams on their transit cards. Just a simple deposit fee for the card which has no expiration date, you use only what you want whenever you want, and when you want your money back, you get all of it back minus the deposit. I can have 100,000 Korean won worth stored in my T-Money Card, about 10,000 Japanese yen worth stored in my Suica card, 800 Hong Kong Dollar worth stored in my Octopus Card, and I can let it stay there as long as I want until I go there again, without worry that it’ll ever expire and not being charged with gotcha fees. CTA actually sent me a Ventra card as I had the old ChicagoCard registered to my new address in LA. As with everything these days, you need to read the fine prints. The Ventra Card consists of two parts: the transit card portion where you load up cash and passes in which to ride CTA and PACE buses, and the debit Mastercard portion where you can use the card to buy things anywhere Mastercard is taken. There is NO FEE for the Ventra Card this so long as you DON’T activate the debit card feature. But, if you activate the debit Mastercard feature, then you get charged with the fees, but only if there’s no activity on it for 18 months. I agree this is confusing, but comparing the Ventra Card to the TAP Ready Card, the BS fees on the Ventra Card is a lot better than the TAP Ready Card. Ventra Card has no maintenance fees and there are ways around to beat those fees for being incurred, whereas the TAP Ready Card dings you with it with no way around it. But I agree with the article that Chicago should’ve done a lot better to explain all these fees. A lot of people in America are too illiterate to understand these concepts so it would’ve been better if they made drawings and pictures to explain the fees and the ways around it. Hopefully, LA Metro takes a hint from Chicago if they decide to revamp their TAP Ready Card. The Jalopnik story is a dead link.